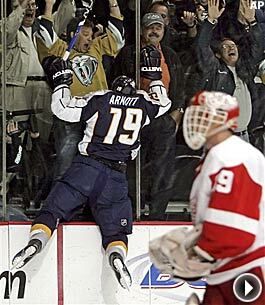 Jason Arnott scored with 3:58 left in regulation, the second Nashville goal in nine seconds, as the Predators stormed back for a dramatic 5-3 win over the Detroit Red Wings in Game 3 of their series. It’s no secret just how much of a role momentum can play in the playoffs. If that’s the case with the Detroit Red Wings and Nashville Predators, their series could be far from over. Ryan Suter and Jason Arnott erased a late 3-2 deficit by scoring just nine seconds apart, as the Predators avoided what likely would have been an insurmountable 0-3 deficit with a 5-3 win over the Wings at the Sommet Center on Monday night. Nashville now has a chance to even the series when it hosts Detroit again in Game 4 on Wednesday night. The Red Wings seemed destined to take a 3-0 lead in the series when Pavel Datsyuk broke a 2-2 tie just 40 seconds into the third period. But Suter beat Dominik Hasek with a slap shot from just inside the left point with 3:57 to play to tie the game – just moments before Arnott blasted one past the 43-year-old Detroit netminder to give Nashville the lead. Martin Erat iced the Predators’ first win of the series with an empty-net tally at 19:39. Detroit held a 2-0 lead before things began to unravel. Kris Draper broke a scoreless tie 8:56 into the game, when he took a pass from Jiri Hudler and fired a wrist shot from a sharp angle past Dan Ellis for his second goal of the playoffs. Hudler put the Wings up by a pair with a power-play tally at 9:12 of the second period. After Alexander Radulov was whistled for slashing, Hudler stuffed home a loose puck after Ellis was unable to control Niklas Kronvall’s shot from the point. It was Hudler’s first goal of the postseason. "We sure thought we were set up pretty well," Detroit coach Mike Babock said. "It looked like things were going real good ... It was a good momentum swing for them, and we didn't handle it very good." Nashville climbed back into the game quickly, as Radulov and David Legwand scored less than three minutes apart later in the second period to tie the game. Radulov made it 2-1 when he redirected Suter’s wrist shot from the point past Hasek at 12:53. Legwand then tied it as he beat Hasek on a one-timer from J.P Dumont at 15:01. Both goals came at even strength. The Red Wings appeared to have regained the momentum when Datsyuk put Detroit back in front early in the third period. The highly-skilled forward faked a pass before firing a wrist shot past Ellis on an unassisted tally. It was Datsyuk’s first goal of the playoffs. "I don't know what it is. When we get down, we seem to push that much harder," Arnott said. Nashville outshot Detroit 29-26 and scored two more goals than it had in the first two games combined. While the mood was somber in the Red Wings’ locker room immediately following the loss, an early goal in Game 4 on Wednesday night would quickly turn the frowns upside down. With the puck skittering down the right side of the ice, Minnesota Wild forward Brian Rolston took one path after it and Colorado Avalanche defenseman Jeff Finger took another. The result of their chase ended up determining which team grabbed the edge in their Western Conference quarterfinal. Finger appeared to expect the puck to kick around the boards behind the net and was skating around the left side of the goal, hoping to touch up for the icing. Instead, it hit the side of the net and Rolston was able to collect and circle back along the right wing boards. He found a cutting Pierre-Marc Bouchard with a pass, and Bouchard roofed a shot over Jose Theodore 11:58 into overtime as the Wild silenced the crowd at Pepsi Center and took a 2-1 lead in the best-of-seven series. Pierre-Marc Bouchard put the puck past Jose Theodore 11:58 into overtime to give the Wild a 3-2 victory over the Avalanche on Monday night. Minnesota leads the Western Conference quarterfinal series 2-1. All three games in the series have gone beyond the third period and Minnesota has now won the last two. They will try to take a commanding 3-1 lead back home with Game 4 in Colorado set for Tuesday night. Neither team could be accused of sitting back in the extra period, as the Wild took 12 shots to the Avalanche’s seven. Joe Sakic forced overtime for the Avalanche by scoring with 5:04 left in regulation, after teammate Andrew Brunette was knocked into goalie Niklas Backstrom by Minnesota’s Aaron Voros. Sakic fired the puck in while Backstrom was on his back, unable to make a play. Mikko Koivu scored for the third straight game and Rolston had a shorthanded goal as Minnesota came back from trailing 1-0 after two periods. Once again, Theodore blanked the Wild over the first 40 minutes only to falter late in the game – all eight of Minnesota’s goals in the series have come in the third period and overtime. Koivu skated through the slot and redirected a centering feed by Todd Fedoruk at 7:13 to tie the game. Rolston gave them a 2-1 lead at 11:32 with a shorthanded goal. Pavol Demitra gained control of the puck and raced past Sakic, setting up a 2-on-1 break before sending a pass over to Rolston for the score. Backstrom was superb in making 44 saves, including 28 over the first two periods. The only shot that beat him came off the stick of Brunette with 4:41 remaining in the first. Sakic took a shot that ricocheted off Backstrom and right to Brunette, who put it in the net. It was the seventh consecutive playoff game in which Minnesota has allowed the first goal. Going back to a first-round series between the teams in 2003, five straight Wild-Avalanche playoff games have gone to overtime, all of them ending with 3-2 scores. Ironically, Brunette scored the Game 7 winner for Minnesota five years ago, the final goal allowed by Hall of Famer Patrick Roy. Material from wire services and team websites was used in this report.